Not many people would regard the diagnosis of a serious autoimmune disorder as good news. But for Meredith Kass, 17, learning she had systemic lupus erythematosus was far preferable to her doctors’ original suspicion — lymphoma. Kass, a senior at Kellenberg Memorial High School and a resident of Seaford, first suspected something was wrong two years ago. A member of her school’s cheerleading and varsity lacrosse squads, she began complaining of fatigue. “I was just tired and achy all the time,” she recalled. Lupus has a number of forms, Kass explained. Cutaneous and discoid lupus primarily affect the skin and cause rashes. With SLE, the body’s immune system battles many of the major organs. “It sees the cells as enemies,” Kass said. “It’s like my body is fighting itself.”At first, she suspected mononucleosis or Lyme disease and began making the rounds of doctors — epidemiologists, rheumatologists, pediatricians. She was admitted to a hospital with a fever of 101.8 degrees and was being prepped for a bone-marrow biopsy when her pediatric hematologist, Dr. Philip Scimeca, halted the procedure almost at the last minute. “He said, ‘I know what it is,’” Kass said. She was fortunate, she said, because it can take as long as six years to accurately diagnose lupus. Meanwhile, “You’re getting worse,” she said. To treat her disease, Meredith takes steroids, and the anti-rejection drug CellCept, which is primarily given to people who have had transplants. The disease has slowed her down — a little. Since her diagnosis, she has had to quit lacrosse. A standout on the Kellenberg squad, she was recruited by a number of colleges. But she knew she didn’t want to play college lacrosse. “It’s like having a full-time job,” she said. She remains a cheerleader, however. Because she is small, she is the top person in formations, which has its risks. She recently suffered a concussion in a fall. “We were getting into position, and someone’s hand slipped” at the bottom of the formation, Kass said. “It’s the first time I’ve fallen where I hit my head.” She was expected to make a full recovery before the end of the month. Kass was scheduled to fly to Rome on Friday, for an audience with Pope Francis. The visit was coordinated through the Make-A-Wish Foundation, and the plan is for her to meet the pope on Oct. 31. Make-A-Wish grants wishes for those with serious chronic disorders that affect the quality of their lives, Kass said. “Some of my friends thought it was strange that I didn’t wish for something else,” Kass said. “But I’d been interested in him since he was elected when I was in sixth grade,” she said of the pope. Her church history class had read about papal elections, she explained, so she followed the progress of then Cardinal Jorge Bergoglio from his position as archbishop of Buenos Aires to bishop of Rome. 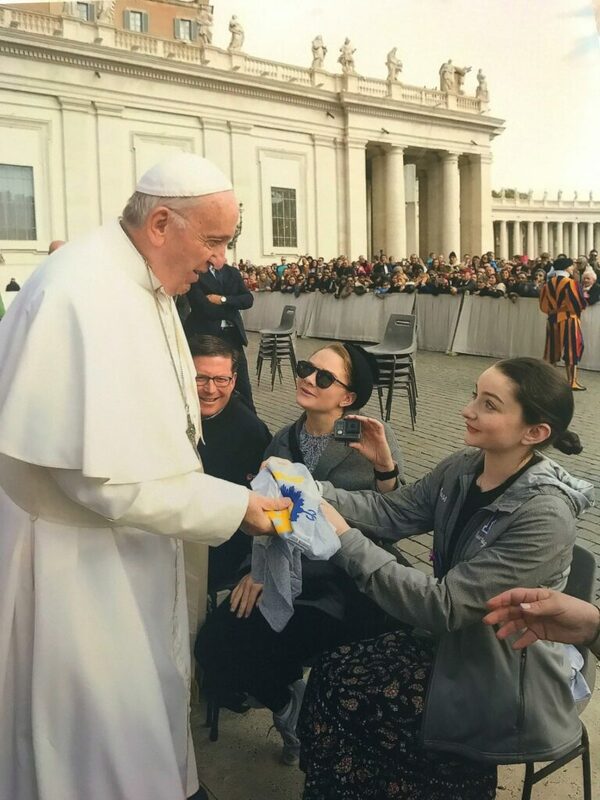 If all goes well, she will attend the pope’s Sunday Angelus address in St. Peter’s Square, a general audience next Wednesday and a more private meeting with a smaller group. While she was excited to go to Rome, Kass said, she felt that Make-A-Wish should have singled out someone else. “It’s like, others might need it more,” she said. Nevertheless, while in Rome, she has a full agenda, including activities not found on the average tourist’s list. “I want to see the incorruptible saints,” she said, referring to the saints whose bodies have not decomposed. A number of Roman churches boast such relics. To help fill her down time with productive activities, Kass started a charity shortly after her diagnosis called Meredith’s Favorite Blanket, which makes blankets to donate to people in hospitals and nursing homes. The blankets — simple constructions of two pieces of fabric tied together in a series of festive bows — can be made in less than an hour. Meredith’s mother said it takes her about 20 minutes, although others take much longer. The blankets are assembled by family, friends and Kass’s informal support group. To date, the crew has created more than 400 blankets, for the Long Island Coalition Against Bullying and Frankie’s Fight, among other groups. MFB is in the process of incorporating as a 501(c)(3) charitable nonprofit. Kass is also active in activities to raise awareness of lupus. Last Sunday, she joined a group of about 100 people for a fundraising walk in Eisenhower Park. “There were about 100 in our group, and maybe 400 altogether,” she said. She is uncertain about the next chapter in her life, but that has more to do with college than with her health. Lupus is an incurable condition but can be treated as chronic; most patients have normal or near-normal life expectancy. Her top college choices are Hofstra University and Sacred Heart University, in Fairfield, Conn. She hopes to become a physician’s assistant. “Hofstra has a five-year P.A. program, and I could live at school but be close to home if I needed something,” she said.